Stylish, elegant, and alluring, Sekhmet got its name from the lion-headed war goddess of ancient Egypt. And the typeface does possess a kind of feline, forward-directed energya result of its calligraphic detailing combined with a very slight slope in the roman. 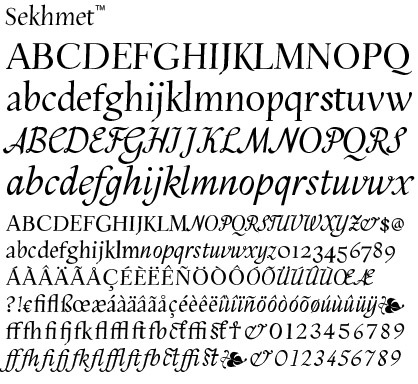 Sekhmet is essentially a display face; still, being as carefully crafted as any of the designer’s text fonts, it also works well in body copy, especially at larger point sizes. Comes with a book-weight roman and calligraphic italic. US$49.